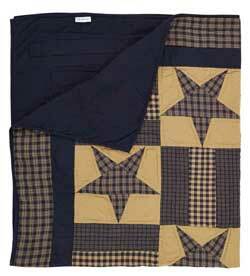 The Teton Star Quilt patchwork decor mixes navy and khaki fabrics in a "stars and bars" vintage layout. Proudly displaying traditional 8-point stars alternating with patchwork blocks in navy blue and tan finished with triple borders. Reverses to solid navy blue. Part of the Mayflower Market line by VHC Brands. Teton Star Quilt, by Ashton & Willow. The Navy Star Collection features a navy and khaki palette in a stars and bars patchwork quilting pattern. This is for the KING sized quilt. Machine pieced, hand quilted with stitch in the ditch and echo quilting. Measures 105 x 95 inches. 100% cotton shell and fill. Other coordinating pieces also available! Teton Star Quilt, by Ashton & Willow. The Navy Star Collection features a navy and khaki palette in a stars and bars patchwork quilting pattern. This is for the LUXURY KING sized quilt. Machine pieced, hand quilted with stitch in the ditch and echo quilting. Measures 105 x 120 inches. 100% cotton shell and fill. Other coordinating pieces also available! Teton Star Quilt, by Ashton & Willow. The Navy Star Collection features a navy and khaki palette in a stars and bars patchwork quilting pattern. This is for the QUEEN sized quilt. Machine pieced, hand quilted with stitch in the ditch and echo quilting. Measures 90 x 90 inches. 100% cotton shell and fill. Other coordinating pieces also available! Teton Star Quilt, by Ashton & Willow. The Navy Star Collection features a navy and khaki palette in a stars and bars patchwork quilting pattern. This is for the TWIN sized quilt. Machine pieced, hand quilted with stitch in the ditch and echo quilting. Measures 86 x 68 inches. 100% cotton shell and fill. Other coordinating pieces also available! Teton Star Quilt, by Ashton & Willow. The Navy Star Collection features a navy and khaki palette in a stars and bars patchwork quilting pattern. This is for the THROW-sized quilt. Machine pieced, hand quilted with stitch in the ditch and echo quilting. Measures 50 x 60 inches. 100% cotton shell and fill. Other coordinating pieces also available!